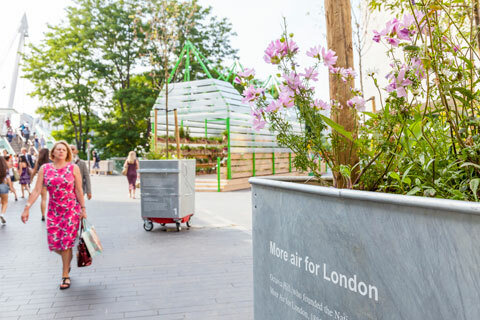 As someone who loves apples, I was intrigued to hear about Octavia’s Orchard, a new green space commissioned as part of Southbank Centre’s Festival of Neighbourhood. Inspired by the work of Victorian social reformer and founder of the National Trust, Octavia Hill (1838-1912), it has been designed by architectural practice What if: projects, in partnership with the National Trust’s London Project and Southbank Centre in order to highlight the continued lack of access to green space in high density housing areas and open up the opportunities these neglected, forgotten and unloved spaces in the city can offer to urban communities. The orchard is currently located on the Southbank Centre’s Mandela Walk, but, London urban community groups are being invited to take home part of the orchard, Each of the four inner-city housing estates chosen will take home eight apple trees and one of the benches, to form the nucleus of their own permanent orchards. The four successful applicants will also be twinned with four of the National Trust properties – Fenton House and Garden, Osterley Park and House, Morden Hall Park, Sutton House and Breakers Yard – and will receive support and training from their expert gardeners. Planting will take place at the beginning of September. Interested groups wishing to apply should email octavia@what-if.info. For more information, visit the What if: website at http://www.what-if.info/Octavias_Orchard.html.